For complete original solution, we charge 22$. If you need complete original solution, please send us an email at support@iqrajavaid.com with the subject ORIGINAL SOLUTION: CIS170C Lab 7. 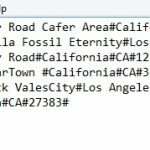 Create a C++ console application that will store and retrieve names and addresses in a text file. The program should do the following. It should accept a series of names and addresses from the console. 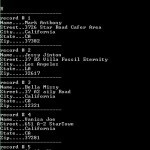 The user’s input should be written to a text file in the CSV format described in the lesson, but do not include the field names in the first row of the file. 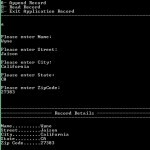 Use a delimiter to separate the records. 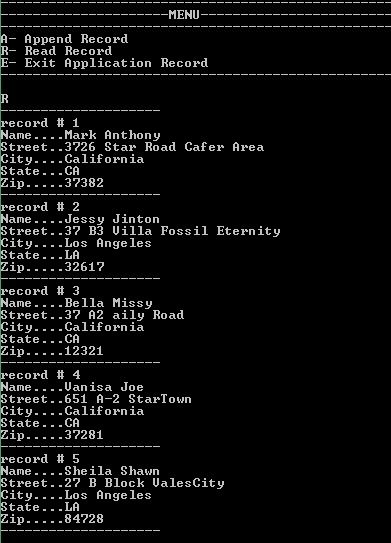 Read the records from the text file, and display them in a user-friendly format. 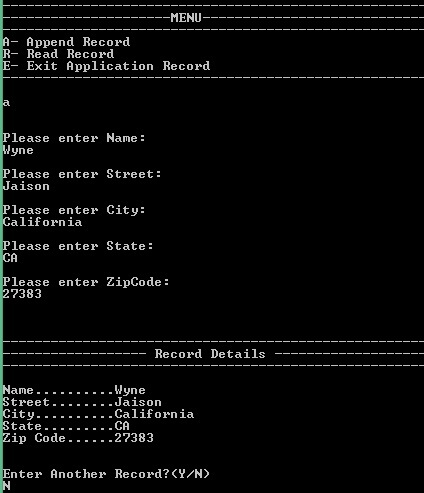 Provide a menu to allow the user to append records to the file, display the records, or exit the application. Build upon the code below to complete the assignment. The pseudocode for the writeData function is shown below. The program input should appear similar to this. "Enter another Record? (Y/N) "
The file structure should look like this. The file output should appear similar to the following.